THE WRITING BUDDHA - Opinions | Books | Movies: She Swiped Right into My Heart by Sudeep Nagarkar (Book Review- 3.25*/5) !!! 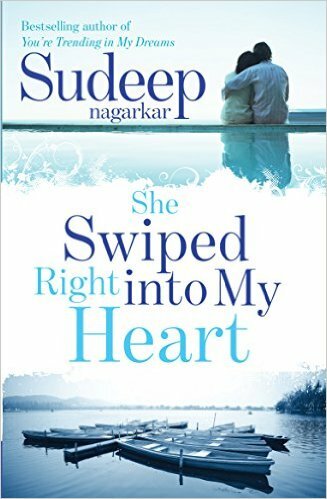 She Swiped Right into My Heart by Sudeep Nagarkar (Book Review- 3.25*/5) !!! SUDEEP NAGARKAR has become THE NAME in the romantic genre which makes it easy for his book to sell in large numbers even before its release. With 6 books in his kitty and almost each of them doing well in market, his 7th book- "She Swiped Right Into My Heart" has just released today and as usual, I had high expectations from him like every time. I would say that by his own standards, this is not his best but certainly a fine attempt as he have tried to cover several issues in this fictional story. I like how Sudeep doesn't write books in a revolutionary way with each sentence presenting itself as it will change the whole nation in that second itself but he tries to influence your thought process with his stories gradually. Though I feel that at this stage, he should start attempting little more mature stories with a tone of thriller, spirituality or based on corporate theme which can attract even the age group above 25. Talking about "She Swiped Right Into My Heart", it is a story of two sisters- Shibani and Tushita, their friend- Geet and two boys who take entry in their life eventually- Rudra and Vivaan. All 5 of them share a single roof many a times in this story. Though it becomes quite unbelieving that warden of a girl's hostel is allowing boys just because they don't look any dangerous. Author has beautifully captured how a girl faces physical abuses in a relationship and still can't end it overnight because of fear of reaction of her boyfriend. He also discusses another issue where a girl is bullied almost everyday in college where anyone does something which makes her trip and fall on her face etc. The way author discusses this in few initial pages is really disturbing. Though the end of it isn't convincing as I wanted the victims to respond in the similar way to her bullies but she does it quite softly. Many other issues are prominently discussed in this book but the prime is about a girl who identifies her sexual orientation not being straight. And how she ends up fulfilling her sexual desire is another throwback into this book which is majorly covered in 2nd part of it. In short, author is trying to convey many messages to the youth through his stories and that's what makes him click with his fans and new young readers who are picking his books one after another and making him much bigger with each one of them. Coming to the drawbacks of this book, I would say that author takes lot of sentences to assure himself that the particular message is reaching his readers which makes it little boring and irritating when you get the message in the first sentence itself but still end up reading the same thing explained in different ways for next 2 pages. It would be great if author will try to be specific and be confident while describing even a disturbing scenario in a sentence or two. This will ripple more effect on readers. Rest, the twists and turns in this story weren't revealed in a proper manner which lessened its impact. The characters could have been woven with little more finesse the way Geet is treated in the book. You find it hard to connect with anyone else as you do with Geet. Overall, I would say that this is an average attempt by the author considering the standard he has set for himself. I give this 3.25* out of 5. Next time, I am expecting a thriller from Sudeep Nagarkar. Let's watch out!